It is no secret that the era of the app has well and truly arrived. Apps are not just restricted to phones and tablets. In facts, they have made the jump to full time PCs and Apple devices too. App Annie, the company that studies and analyses App stores have just published their predictions for 2017. Similarly, services such as banks will also be more app focused, letting consumers use their services via apps. You can read the full report below, which gives the complete analysis. 2016 is shaping up to be a phenomenal year for the app economy. By the end of December, we expect $52 billion in gross consumer spend on mobile app stores and a staggering $77 billion in gross spend on mobile in-app advertising. Mobile is more mainstream than ever, and businesses from all industries are relying on this channel to bolster existing revenue streams and unlock new ones. This year also saw some key shifts play out in the app economy, many of which we called out in our 2016 predictions report; in fact, looking back on our analysis, a majority of our predictions turned out to be accurate. For example, commerce and online-to-offline (O2O) apps in Asia saw a wave of consolidation headlined by Didi’s acquisition of Uber China, putting an end to subsidy wars. We also predicted that Niantic’s Pokémon GO would lead to increased interest in augmented reality (AR). Of course, we had a few misses as well. Notably, iPad productivity downloads actually declined year over year following the launch of the iPad Pro. 2017 is set to be another banner year for the app ecosystem. In addition to key platform innovations and continuing growth of mobile-first companies, more companies from traditional industries will realize that mobile is no longer an optional investment. We forecast that gross mobile app spend, including app store spend and advertising spend, will hit $166 billion in 2017. Gross consumer spend on mobile app stores will constitute $65 billion. Games will remain the primary driver of this revenue, but subscription revenue from dating and media streaming apps will grow faster. Gross in-app advertising spend will account for $101 billion. Social media, video platforms and games will continue to receive a substantial share of this revenue. 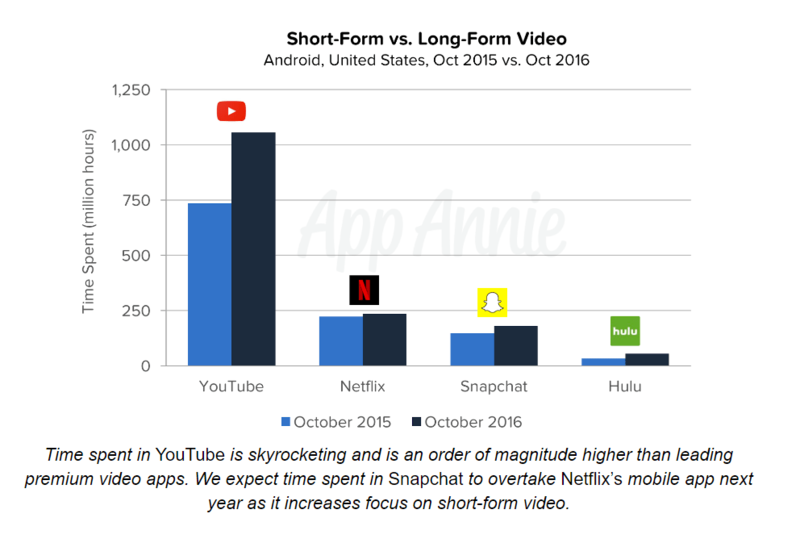 Within these categories, mobile video ad formats will experience the fastest revenue growth. In addition, brand advertising will be a strong contributor, growing to 12.5% of total mobile in-app ad spend. Time spent in shopping apps was up 52% year over year on Android phones worldwide (excluding China) during the first three quarters of 2016, largely due to growth in mobile commerce. In 2017, we expect the strongest growth to come from brick-and-mortar retailers as mobile apps reinvent the in-store experience. Total sessions of apps from other brick-and-mortar businesses, notably banking and quick-service restaurants, will also see an uptick in 2017 as companies learn to incorporate mobile into their operations. In 2017, we expect a wave of consolidation among commerce apps in the West along the lines of what we saw in Asia this year. During the innovation and discovery phase, ridesharing and delivery startups raised significant venture capital investment to fund growth and user acquisition. Discounted pricing was among the primary ways to draw in new users, but this also led to unsustainable unit economics. As the market matures in 2017, we expect consolidation to normalize competitive dynamics and put a few dominant players on the path to an eventual IPO. For the last few years, Netflix and premium video streaming services were viewed as potential disruptors to traditional pay-TV. However Netflix views itself as a single network; i.e., it competes with individual TV networks rather than a bundle of networks. This characterization is a better fit with Netflix’s investments in original content. This strategy should still lead to subscriber and engagement growth as primary consumption channels shift. However, with limited libraries, premium subscription services will find it difficult to replace the existing TV paradigm by themselves. In 2016, much of the discussion around chatbots centered around the concept of “conversational commerce.” The counter-argument to this is the very existence of the on-demand economy. Food delivery and ridesharing apps exist because they remove friction — they replace conversation with a graphical user interface (GUI). On the contrary, the power of messaging lies in making existing conversation more efficient; for example, customer and after-sales service. Facebook is likely to lead the charge here through increasing integration of Facebook Pages with messaging apps like Facebook Messenger and WhatsApp. Chatbots will still play a role, but artificial intelligence capabilities will not be sophisticated enough to carry on complete customer service conversations in 2017. Instead, chatbot use cases will remain limited to notifications and routing users to the right human touch points. Google presented a bold vision for a voice-assisted future when it unveiled the Google Assitant. While we believe this will help increase the number of voice search queries on mobile, it will fall short of a large-scale shift in app interaction patterns. We estimated that voice interactions accounted for approximately 1.2% of total smartphone sessions on Android phones in August 2016. Even with meaningful growth in voice search, we expect voice interactions to remain well under 2% of overall smartphone sessions. This is because existing touch-based interactions are already deeply ingrained and unlikely to shift at this point in the maturity cycle. That said, on-screen suggestions based on the same underlying AI will gain traction. Over the last few years, every successful mobile game publisher has had to contend with clones of their games. Niantic’s games — particularly Pokémon GO — will be an exception to this rule. Their underlying location gaming platform is based on a valuable technology stack (on top of Google’s Maps and Places API) and millions of user-submitted locations from players of Ingress, their previous game. This gives Niantic the first structurally defensible business model in gaming. At least in 2017, we believe the only new location-based augmented reality (AR) games will come from Niantic themselves in partnership with other IP owners. Pokémon GO itself will see engagement normalize to an extent, but with significant bumps during periodic in-game events and major feature additions. We also expect to see more retail companies sign up for Niantic’s AR-based sponsored location program to drive store traffic. 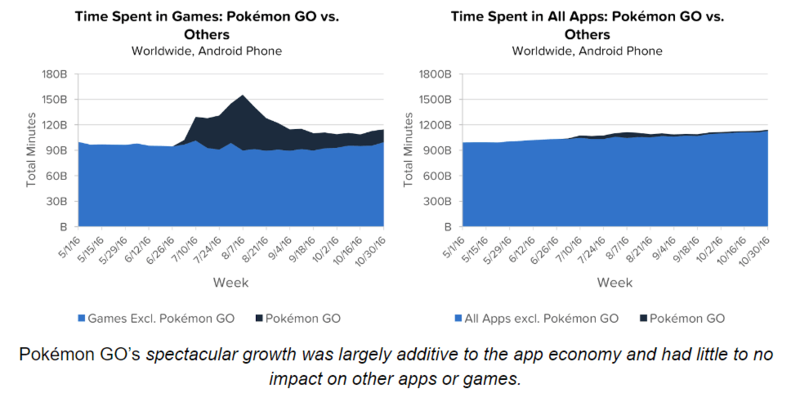 Shortly after Pokémon GO hit the market, we pointed out that it was additive to the app ecosystem and did not have a meaningful impact on competition. The AR-based gameplay targeted non-consumption and captured the time users spent away from their smartphone screens. We have already seen a handful of companies from diverse industries leverage this trend to extend their customer relationship, from Sears (retail) and Swissquote (banking) to TBS’s Catch Coco (media & entertainment). In 2017, we expect many more companies to experiment with smartphone AR, particularly those that rely on a physical presence. The adoption of mobile VR accessories like Gear VR and Google’s Daydream Viewer will dramatically outpace PC-based VR devices like the HTC Vive and Oculus Rift. This will be driven by significantly lower ownership costs and a wider gamut of use cases, including 360-degree video for news, sports, entertainment and even education. By the end of the year, we expect adoption of mobile VR to be roughly where in-home voice agents were in 2016. 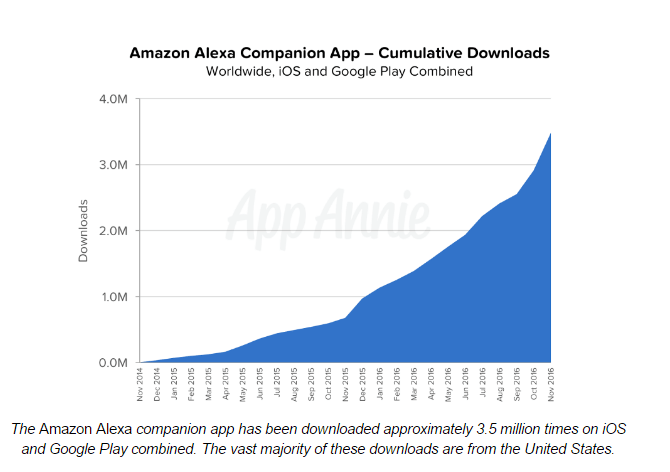 The Amazon Echo led the hype cycle in 2016 as early adopters flocked to its futuristic premise, leading to approximately 3.5 million cumulative downloads of its companion app through November 2016. Device adoption is poised to grow thanks to an expanding range of “skills” and the recent launch of Google Home. However, voice agents will remain a niche in 2017 as the relative paucity of other connected home devices will limit the pace of mainstream adoption. Consumer and development interest in smartwatches hasn’t quite lived up to the hype from a few years ago. In response, we believe OEMs and platform owners will shift investments over to smart glasses, from basic camera-equipped eyewear like Snap Spectacles to full-fledged AR platforms like Microsoft’s HoloLens. But with the underlying technology still immature, standalone commercial success will remain elusive in 2017. Subscribe to our weekly digest to see more app industry reports, conference updates and guides. Want to take your app business to the next level? Track the performance of millions of apps across the world with download, revenue, demographic and usage estimates from App Annie Intelligence. Request a demo today. 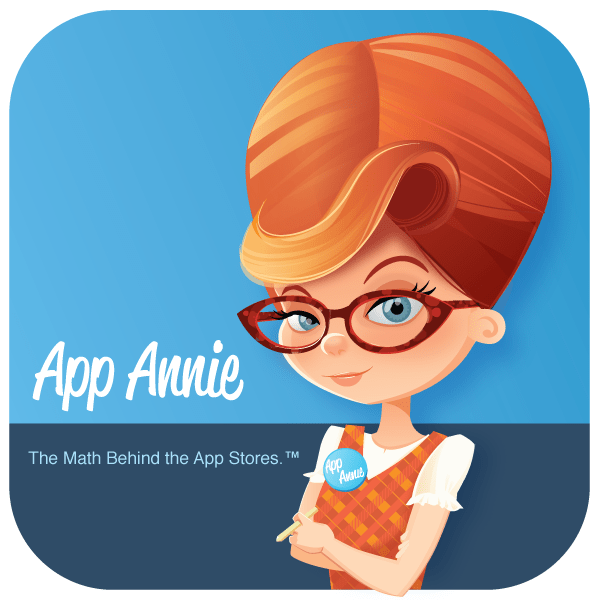 App Annie Intelligence is currently available for the iOS App Store and Google Play. It does not currently provide estimates for other app stores, such as the Amazon Appstore. While iOS and Google Play represent a significant portion of the app market in many countries, that is not the case for some countries. For example, China has a number of sizable third-party Android app stores. App Annie Usage Intelligence data for smartphones and tablets were derived from mobile usage data collected from a large sample of real-world users, combined with additional proprietary data sets. App Annie tracks usage at the device level using a privacy-protective hashed device ID. Data is only reported to third parties in aggregated format. Certain trademarks and/or images used in this report may belong to third parties and are the property of their respective owners. App Annie claims no rights to such trademarks or images. Previous story Review: TomTom Spark 3 – Heart Rate, GPS, Fitness and Music – but nothing more!